In order for adolescents to understand and take in new information they must pay close attention on the information being presented. Adolescents are able to allocate their attention in four different ways, two of which are divided attention and sustained attention. Divided attention is the second level of mental effort. Divided attention is when an individual concentrates on more than one activity at a time. 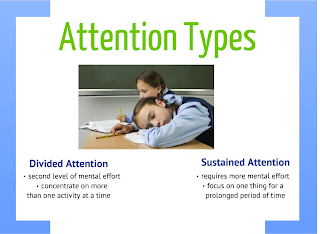 Sustained attention however requires a bit more effort than divided attention. This type of attention occurs when an individual is able to focus on one thing for a prolonged period of time without interruption. With regards to adolescents, neither of these attention practices is particularly easy. In today’s society multitasking has become much more prevalent. With the availability of electronic media, many people engage in several activities at once. Although this may seem like a good practice of divided attention, that is not always the case. Oftentimes multitasking has the ability to greatly reduce the attention to the main task at hand. Therefore it is imperative that adolescents begin to cultivate and strengthen this ability, as it will be utilized often. Sustained attention is also essential for adolescents to conquer. As adolescents begin to engage in more difficult and complex tasks, they will be required to work during longer time frames. Practicing this skill would help adolescents complete difficult assignments and tasks in the future.